LOS ANGELES — An attorney representing nine California public school students told a judge Thursday that laws making it too hard to fire bad teachers and retain good ones are preventing students from obtaining a decent education and must be struck down. Theodore Boutrous Jr. made his assertions in a closing argument in the trial of a lawsuit that seeks to make it easier for administrators to dismiss incompetent teachers with tenure and easier to retain effective ones. Attorneys for those who support leaving teacher tenure laws intact were to make their closing arguments later in the day. Superior Court Judge Rolf Treu, who is hearing the case without a jury, did not indicate whether he would issue a ruling immediately afterward or a written one later. Boutrous said that saddling a student with a bad teacher for just one year can cost a youngster tens of thousands of dollars in future lifetime earnings. “When a student has a grossly ineffective teacher, it harms them. It harms them for the rest of their lives,” Boutrous said. Administrators clearly know who their ineffective teachers are, but tenure laws tie their hands, he said. The closing arguments came after weeks of testimony from top school officials and others. The group of students who brought the lawsuit say that once an incompetent teacher is granted tenure, it becomes so difficult to fire them that students are denied their right to a good education. Attorneys for the state and teachers unions respond that the 18-month probationary period before a teacher is granted tenure is sufficient time to weed out incompetents. 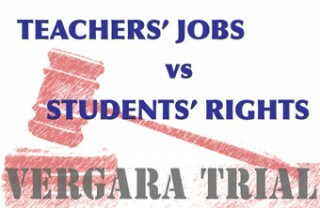 The trial represents the latest battle in a nationwide movement to abolish or toughen the standards for granting teachers permanent employment protection and seniority-based preferences during layoffs. Dozens of states have moved in recent years to get rid of or raise the standards for obtaining such protections. The students bringing the lawsuit want longer probationary periods before teachers are granted tenure and a streamlined process for firing underachieving instructors. They also want an end to “last hired-first fired” policies when financial constraints make it necessary for school districts to lay off instructors. Teachers union officials say those job protections are vital to keeping quality teachers in a profession already losing talented people to higher-paid private-sector positions.